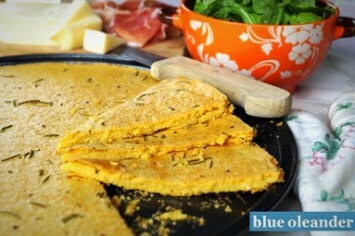 Farinata originally comes from Liguria in Italy, but nowadays it is an established part of the culinary traditions in the Central and Northern part of Italy. Combine the chickpea flour with water and stir until a uniform mixture forms. Leave covered overnight. Then add half of the olive oil, and salt and mix everything well. Into a pizza pan pour the remaining olive oil. Then the chickpea mixture. Sprinkle with chopped rosemary and black pepper. Bake in 180°C/350°F for 20-30 minutes. Serve with fresh cheese and assorted sliced meats.